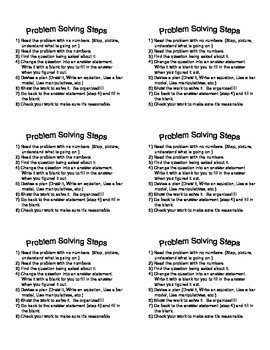 This is a file of Math Problem Solving Steps that can be used to print onto shipping labels (6 on a page). I use these for students to put into their math notebooks so they are always available. You can also print on regular paper and students can cut out and glue into their notebooks. 8 steps are given from "Read the problem with no numbers and think about what is going on...." to "Check to make sure your answer is reasonable."